Last month we brought you details of Lego's biggest kit yet - the 2048-piece Mercedes-Benz Unimog. But now the firm has gone one better and built an entire car out of the small plastic bricks . This Ford Explorer "rolled off the line" from Ford's Chicago Assembly Plant, where the the more conventional Eplorers are built. This one, however, took 2,500 man hours to create, consists of 380,000 Lego bricks and weighs more than 1200 kgs. Neither Lego nor Ford can at this stage confirm its Euro NCAP crash test rating, though it's said to be easy to reapir in the event of a collision. 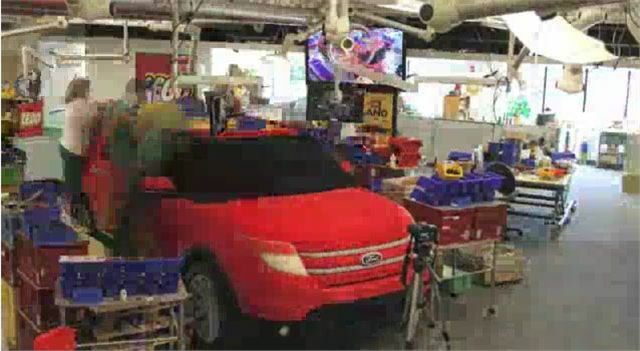 The car is destined to be on display at the new LegoLand theme park in Florida and part of a Ford Driving school. The park opens on 15 October. In all more than 50 million Lego bricks have been used at the new park.